Since its launch six years ago, TheShout has attracted overwhelming trade interest. The site is updated each Monday, Wednesday and Friday and is the first to market with liquor industry news, product launches and events. On-premise and off-premise readers have no trouble keeping up with changes and developments relevant to the wider hospitality industry thanks to TheShout’s free e-newsletter, sent three times a week – subscribe. 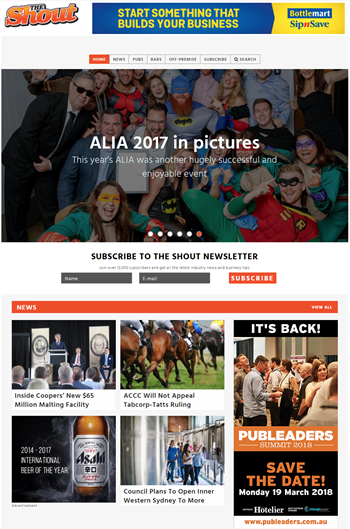 Aside from having its own dedicated editor, TheShout also draws upon three respected and experienced editors from three successful print publications: National Liquor News, bars&clubs, and Australian Hotelierto contribute content.